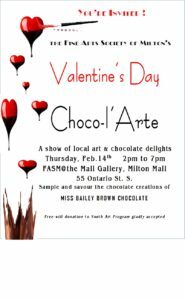 FASM at the Mall Gallery is in the Milton Mall, beside Northern Reflections. It is a large, bright space where several FASM members display their artwork, prints, greeting cards and more on a monthly and rotating basis. It is also where you can see “artists in action” during Open Studio and Thursday Art Drop-in, and also where events are held from time to time, such as workshops and artist receptions. Join in on the fun at FASM at the Mall Gallery on Thursday, February 14, 2019, from 2 pm to 7 pm. Art events, art displays, and scrumptious chocolate on offer for this special day of hearts. Open Monday to Friday, 11 to 4 pm, Saturdays 10 to 4 pm. Located in the heart of town, Milton Mall is still one of the best locations for Miltonians of all ages to shop, browse, meet, and participate in community events in a bright, cheerful, and active space. Their commitment to hosting various community-oriented activities, together with our long-standing partnership with them, has given us a vibrant home where we can work, connect with the community, and display the artwork of our ever-growing membership in this unique space. Drop in, browse, or take a break in our lounge area – it is a warm and welcoming space. You just might find that special gift for a friend or a keepsake from one of the FASM community murals. Whether to shop or browse, chat or rest, paint or watch, pop by soon and see what we are all about. Held in the large area toward the back, members and non-members can enjoy painting and creating in this bright space. Join us here for Open Studio, Classes and Workshops, and Thursday Drop-In. Sit Times: Each exhibiting artist must sign up to “mind the store” for a minimum of 4 shifts (equal to 8 hours). Intake: Artists are expected to hang/display their own work. Artwork that is not properly secured will be removed. Wall labels will be printed for you to ensure consistency. Please email your bio to umcdermid@gmail.com. * Artists can use the gallery for their own reception to feature their art. This location is growing in familiarity with shoppers of the mall. For more information, please contact fasminfo@gmail.com. Do you have a few hours per week to spare? 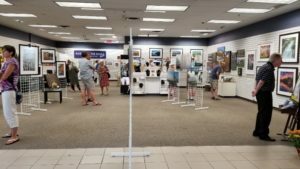 The FASM at the Mall Gallery is a very pleasant place to pass a morning or afternoon, allowing visitors a chance to view and purchase outstanding fine art by local artists. If you are interested in adding your name to the schedule, contact fasminfo@gmail.com.